For members of the Orsini family, see Paolo Giordano Orsini. 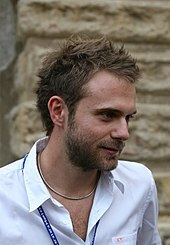 Paolo Giordano (born 1982) is an Italian writer who won the Premio Strega literary award with his first novel The Solitude of Prime Numbers. Paolo Giordano was born in December 19, 1982, in Turin, Italy. He studied physics at the University of Turin and holds a PhD in theoretical particle physics. The Solitude of Prime Numbers, his first novel, has sold over a million copies and was translated into thirty languages. The Italian language film based on the novel was released in September 2010. Wikimedia Commons has media related to Paolo Giordano.